Russian artists of the beginning of the 20th century, without limiting themselves exclusively to painting, actively worked in the field of book design and book illustration. This is especially true of representatives of the “World of Art”, who deliberately opposed the cult of the past to the present, explicitly stylizing it. The book illustration by its nature hid in itself in this sense a lot of unique possibilities. Kustodiyev, whose first experiments of this kind belong to 1905, did not abandon his book illustrations until his death. He designed and illustrated, for the most part, works of Russian classics – both in exquisite design and mass editions. Among these works are “Dead Souls” and N. Gogol’s novels, “A Song About the Merchant Kalashnikov” by M. Lermontov, “Lady Macbeth of Mtsensk” by N. Leskov, “Singers” by I. Turgenev, N. Nekrasov’s poems, moralizing stories by L. Tolstoy, “District” E. Zamyatin, the story of A. N. Tolstoy. 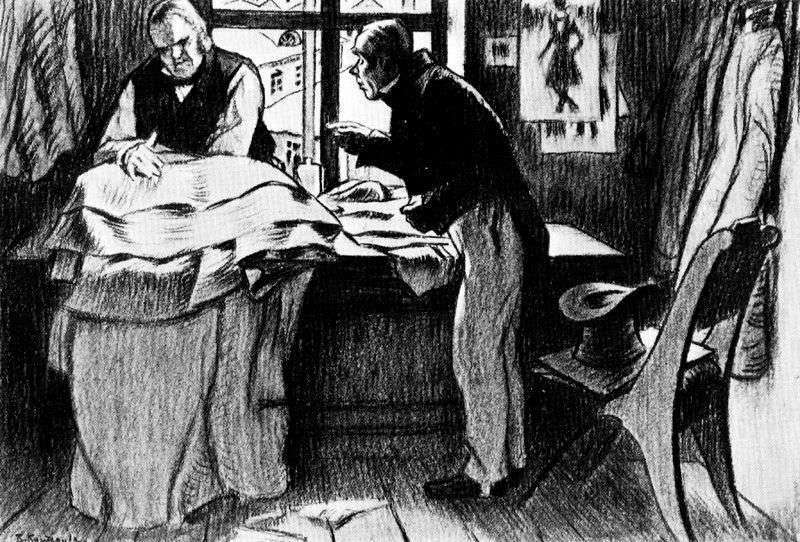 The illustrations for Gogol’s “The Overcoat” and “Akaki Akakievich Petrovich”) refer to 1905, that is, to the artist’s early “book” experiments. They bear the traces of Kustodiev’s then hobby for modernist stylistics. Description and meaning of the painting Akaky Akakievich at Petrovich by Boris Kustodiev.